Calling all celeb style fans: On Saturday, Marc Jacobs married his long-term partner, Charly Defrancesco, in what has to be the most star-studded and fashion-savvy nuptials of the year so far, and the guest list has to be seen to be believed. The pavement outside the reception in NYC became a veritable runway of fashion's finest, all dressed in their glad rags. Notable names included (deep breath) Kate Moss and her daughter Lila, the Hadid sisters, Naomi Campbell, Kaia Gerber, Emily Ratajkowski, Anna Wintour, Rita Ora and Rachel Zoe, amongst others. Unsurprisingly, the wedding-guest outfits did not disappoint. Highlights include Christina Ricci's pale blue Batsheva dress, Kaia's '80s power suit, and the Moss's mother-and-daughter gold-and-maroon get-ups. Time to take notes for your next summer 'do. Scroll down to see our roundup of outfits from 2019's most stylish wedding. 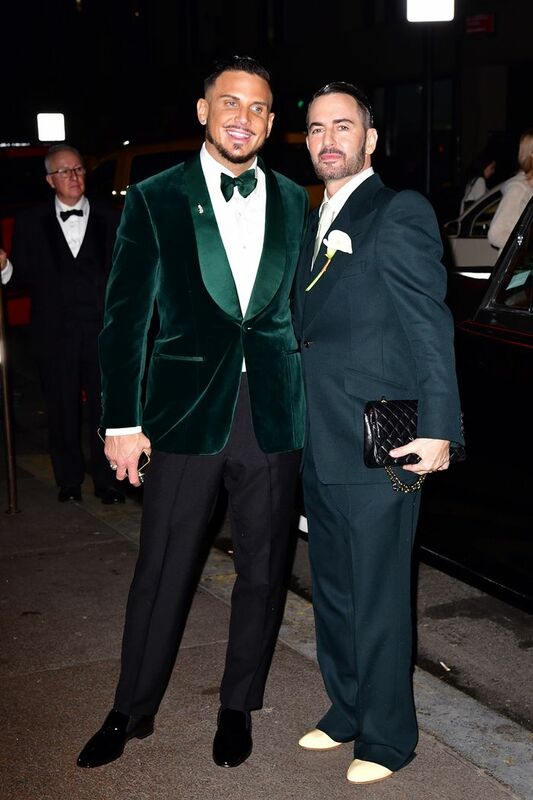 Style Notes: Marc Jacobs looked suitably dapper in a navy suit and lily buttonhole, while his new husband stood out in a forest-green velvet tux and bow-tie. Style Notes: Kaia Gerber channelled some of her mother's '80s spirit with a greige power suit and strappy sandals. Style Notes: The Hadid sisters are our forever #styletwinning muses. We might just copy them and wear trouser suits to our next wedding. Style Notes: Mother-and-daughter dressing doesn't get much better than this. Kate looked so elegant in her maroon column dress, while Lila embodies the party spirit in a gilded mini. Style Notes: Emily Ratajkowski embraces one of our favourite wedding-guest dress trends for this season with a dramatic satin midi dress. Style Notes: Okay, this is our dream wedding-guest dress. Christina Ricci looks to brand-on-the-rise Batsheva for this pale-blue getup, which we imagine would look just as cool dressed down with sneakers.